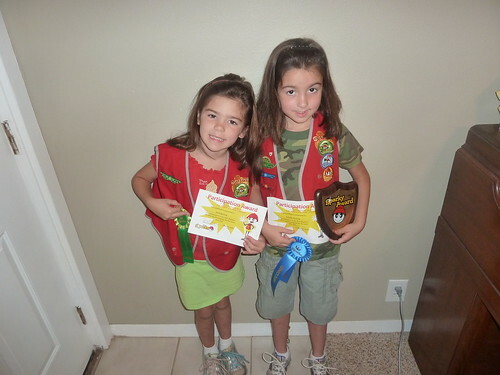 We had our AWANA awards ceremony this past Sunday night at church. This is our third year doing AWANA at church and we have seen some amazing things happen through this program. God sent us the people that we needed to implement this program and from it, order was brought to our Wednesday night program, adults have stepped up to help, children (and adults) have memorized scripture, and last but not least, kids have met Jesus and committed their lives to him. We averaged 90 to 95 kids each week from our Cubbies up through our Journey program (new this year). With any program, we had our ups and downs and off nights, but God saw us through and we survived another year. This year was Anna’s first year in Sparks and she completed her book to receive her "First Book” award. Isabelle received her “Sparky Award” for completing ALL three Sparks books in Kindergarten through Second grade. She worked hard and I am very proud of her. Here is their presentation of the Sparks theme song. Here is Isabelle and Anna with their awards. Isabelle also got her Second Book award because she finished her second book at the first of this year.